I love my mom. More than anything. But, I must admit, Mother's Day has always been a sort of a pain. I haven't lived near my mother for many, many years, so the mere fact of Mother's Day has been a race to remember a list of things not normally on my day-to-day radar. Don't say you don't know what I'm talking about. Face it, holidays can be a hassle. This year is different. This year I find myself thinking about many moms. Top of this list is my mom, of course. 87 and still as sharp and cranky and inquisitive as ever. Sure the body's slowing down, but she continues to be a voracious reader (thank you Kindle! ), can maneuver that walker around her kitchen without ever catching her oxygen tube on a open flame, and still has a secret little stash of candy bars in her "computer room." The best. Her name is Colleen. An Irish term for "young girl." Though her age belies it, her heart still believes she is one. I'm thinking a lot about my wife's mom, too, this year. Gone too soon and for many years now, she was without doubt one of the kindest human beings I have ever known. Never a bad word about anyone. High praise given the challenge of raising eight intelligent and unique children. I mean these people could drive anyone to the brink. Very Catholic, her faith allowed her to think the best of everyone. (A trait that never rubbed off on her son-in-law.) Even when a young actor starting courting her second youngest, she was warm and loving and welcoming. Her name was Grace. From the Latin "gratia," meaning "God's favor." That she was. Another mother has entered the scene this year. My daughter. This is her first Mother's Day as a actual mom. A big fabulous story unto itself, I first met my daughter in person about a year and a half ago. At 29 years old she is stunningly beautiful with an amazing smile and dancing eyes. She is intelligent, witty, funny, talented, discerning, all traits that make for a perfect mom (to say nothing of a perfect daughter). Her name is Heather, which is a flowering evergreen plant that thrives easily in barren conditions. If you are into names and numerology and all that stuff, it also means she is idealistic, creative, selfless, with deep inner strength. 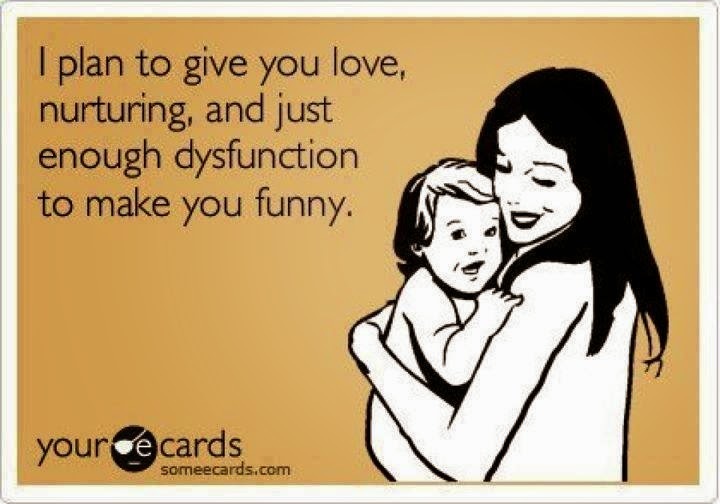 Sounds like the makings for a perfect mom. So, this year I have finally figured it out. Mother's Day isn't really for moms. It's because of them. It's a mid-year Thanksgiving for the women in your life that you never call enough (They know you mean to), never thank enough (They don't expect it), and never understand enough (How could you?). The card is in the mail, FTD has the order, and the alarm is set for early Sunday morning. Yes, it's really hard to be a mother. It is necessary to love women and respect their work! Why do we need this day?There is a gender holiday on the eighth of March.There is a child's birthday. Always at the festive table moms congratulate that she produced such a treasure.And this mother's day is what? And for what? Here is what function this holiday performs? To once again get a gift from a man?